Автономные загрузочные устройства серии SAL-U имеют евро дизайн с бункером из нержавеющей стали, чтобы избежать загрязнения материала. Кроме того, устройство имеет привлекательный внешний вид, звукоизоляционный кожух двигателя, чтобы уменьшить уровень шума и верхнюю ручку для удобства включения движения. Кроме того, дистанционное управление было реализовано с помощью съемной панели управления. SAL-1U~SAL-12U (-E) adopts carbon brush with fast rotating speed and large air quantity while maintain compact appearance, easy for transportation and installation. Wire-control controller is convenient to use with automatic cleaning function. Equipped with motor soft start function and carbon crush consumption prompt (except for three-phase motor). Wire connection point for SPV-U. Differential pressure switch is employed and screener blockage alarm is available(Applicable to SAL-1U~12U(E)). SAL-U has a reed switch, while SAL-U-E adopts photosensor switch with high sensitivity and stable quality. 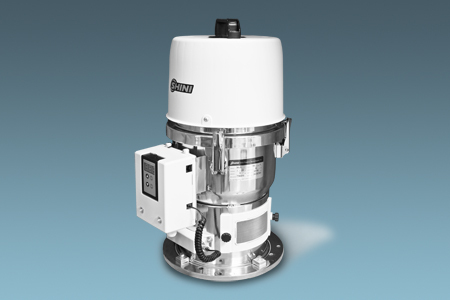 All models equipped with hinged hopper lid that are connected by hinge for easy mesh cleaning. SAL-3U and above model has a out dia.Ф 275 mm base, which can work with all "European type" hopper dryers except SHD-20U and all "Standard" hopper dryers above SHD-75. SAL-1U has a out dia. Ф200 mm base, transitional flange must be mounted when this series work with SHD-20U/40U. 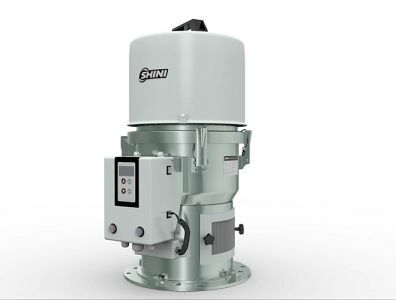 All SAL-U series machine has standard cloth mesh filter and auto-spraying dust cleaner. For SAL-6U and above models, it is available to select air accumulator to enhance the purging and reduce manually clean time. In order to maintain good function, SAL-U-3 series also has standard cloth mesh filter and motor reverse cleaning function without optionally select air accumulator and reverse cleaning kit. Provide both standard and optional heat-insulative Euro collective hopper SCH-6U/12U/24U to mount directly on moulding machine feed port when magnetic proximity switch type hopper loader is used for material loading. Reinforcing auto cleaning of air accumulator is optional (Applicable to SAL-6U/12U).